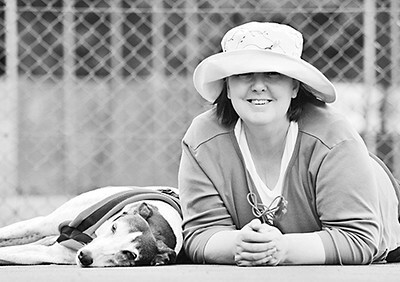 I'm Liz Coleman, aka madaboutgreys, an award-winning Surrey dog photographer, offering photoshoots for hounds, horses and all kinds of pets across London, Surrey and the South East. Why "Madaboutgreys"? It all started with a greyhound, over a decade ago. I walked into my local greyhound rescue, Wimbledon Greyhound Welfare, one bleak winter's afternoon with the vague thought of volunteering. It was an afternoon that changed my life. I began taking photographs for the kennels. Very soon afterwards I adopted my first greyhound, Jasmine, who became my muse and inspiration (and the love of my life). One of my photographs of her won a place in the prestigious Dog Photographer of the Year competition; and suddenly it all snowballed and everyone wanted me to photograph their dogs... And that was how I became a professional dog photographer. I specialise in sighthound and greyhound photography, but I also love photographing dogs, horses, cats and pets of all sorts. I offer photoshoots at my studio in Richmond, Surrey or out on location in the beautiful local countryside. I work with characters of all sorts and am confident that I'll be able to get the best from your pet. Don't worry if your dog isn't trained or can't sit or do stays. I'm used to working with rescues and with pets who are not at all trained and certainly not professional models. I always give nervous dogs bags of time to settle. I love hooligans. And I know how to light difficult subjects like black dogs and white ones. My studio style is elegant and classic, perfect for creating a stunning piece of wall art for your home. Location shoots are more informal: a chance to get some great action shots or relaxed images of your pet in the best of the natural light. I share my life with the resident Madaboutgreys hounds: Lindy, a beautiful, gentle lurcher girl who has the wisdom of an old soul, and Polly, a loopy but lovely young saluki cross, both of whom feature in loads of my photographs. From time to time my husband and I also offer a safe foster billet for lurchers waiting to find a home through Lurcher SOS and support several local and national sighthound rescue charities through pro bono photographic work. You can contact me on info@madaboutgreys.com or call me on 07703 100 333, or just use the CONTACT link above.